All of us, children and adults alike, are nurtured and delighted by the chance to slow down, meet face-to-face, and LISTEN to one another. It was a wise person who said that you cannot hate someone once you know their story. Listening to and telling stories, we learn to know ourselves, our planet, and those we share it with in way that’s accessible, memorable, and fun. 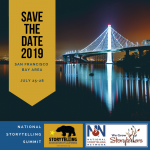 Liz tells stories from around the world and around the corner, to audiences of all ages, at schools, museums, theaters and anywhere folks will listen. …and empowers others to share their own. She’s shown docents how to use storytelling to engage museum visitors. She’s gotten shy 8-year-olds up in front of their classmates. She’s taught seniors to share their “living history” with younger generations. She can help YOU find your story and the confidence to tell it! 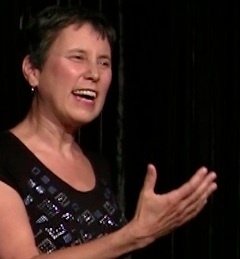 Click here to learn more about Liz’s storytelling performances and workshops. My students were spellbound as Liz brought to life stories, from as far away as Japan and as long ago as the Gold Rush, of individuals who helped their communities. What really impressed me was how they made all kinds of connections between their own experiences and people from other times and places. I want to thank you for telling those stories to us. I want you to come back so that I can tell you my story. The “Tellebration” culmination of Liz's 4th-grade storytelling residency was such an incredible evening! The children were clearly excited about telling their stories; their poise in front of an audience was impressive. Liz worked with our Docents on incorporating storytelling techniques. I was impressed with her patience and perseverance in working with some who were less than receptive to new ideas. I whole-heartily recommend Liz to any organization that is interested in increasing the effectiveness of their interaction with the public. 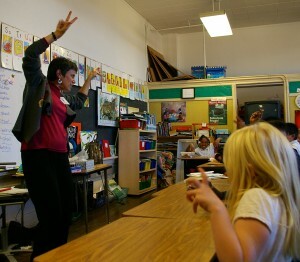 She is an excellent facilitator who knows children and the needs of adult learners. The tools she taught us come alive in a community. With this all sorts of things are possible. Your stories and smile not only impressed the children but the parents as well. I have no doubt our 2012 Bring Your Child to Work Day event would not have been the success that it was without your presence.